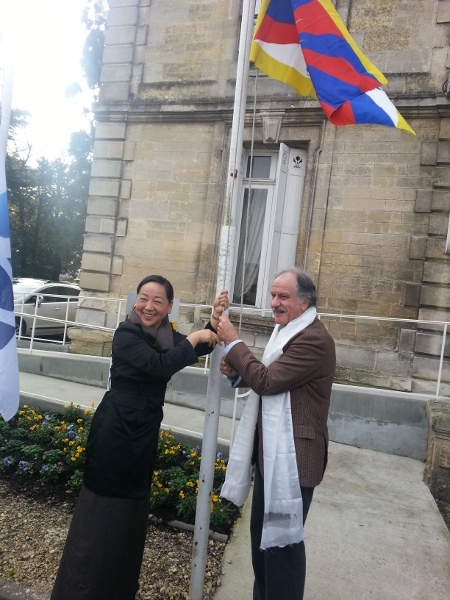 (TibetanReview.net, Dec07, 2014) – The French community of Begles in the Gironde department in the suburb of Bordeaux city on Dec 5 honored the visit of the head of the India-based exile Tibetan administration’s Department of Information and International Relations, Ms Dicki Chhoyang, by flying the Tibetan national flag from its Town Hall. She was welcomed by Mr Noel Mamere, the city Mayor and a member of the French Parliament. Ms Marie Ricalde, a French Member of Parliament from Gironde constituent, also attended the event. Kalon Dicki Chhoyang is on a six-day visit to France, which began in Bordeaux on Dec 4. She will also visit Toulouse, Lavaur, Paris and Grenoble during her six-day tour of France, attending public conferences, meeting with MPs and Tibet support groups, as well as Tibetan communities. She spoke about the current situation in Tibet and the exile Tibetan administration’s middle way policy of seeking autonomy under Chinese rule. At the Institute of Political Science of the University of Bordeaux, more than 100 students and invitees attended her talk on the issue of Tibet, said the exile Tibetan administration on its Tibet.net website Dec 6.